How much farther can eye care tech go? The diagnosis and treatment of eye conditions continues to become more sophisticated over time due to technological advances. From the use of smart devices to newly developed wearable tech, vision care and technology are becoming more integrated every day. 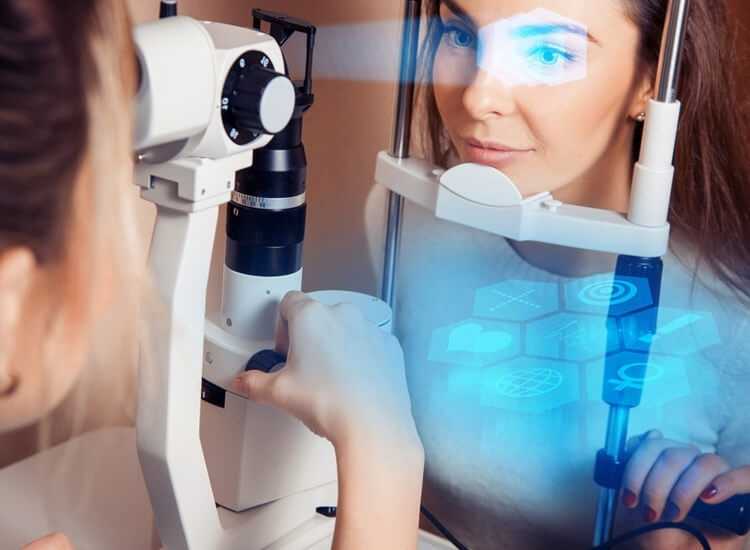 For more on where eye care technology is going, keep reading to see what cool new sight correction gadgets you can expect to encounter now, and in the future. The same smart devices that we use in our everyday lives are being used by eye doctors. From apps to software, optometrists and ophthalmologists are finding new ways to use smart devices during eye exams and for eye treatment. Today, vision diagnostic equipment is almost completely digital. Even the traditional eye chart with rows of letters descending in size is often digitized and projected onto a screen for patients to view. New diagnostic equipment analyzes the eye in extreme detail to detect eye problems or night vision issues. One of the most helpful tools for mapping the interior of the eye without dilation is through digital retinal scanning tools. Lens measuring equipment is accurate and precise when determining your prescription, which helps your vision team quickly find the baseline for where they should begin your vision exam. Diagnosing vision issues has become very advanced due to technology that is fast and efficient. Equipment used to measure pressure in patients’ eyes has become automated and easy to use, which allows technicians to perform the tests while optometrists spend valuable time with patients. In an instant, a machine can determine if a patient has an eye pressure issue or indications of glaucoma. Rohit Varma is a pioneering ophthalmologist whose research focuses on diagnosing and treating glaucoma. He designed new imaging techniques that can diagnose glaucoma due to optic nerve damage, so that patients can receive earlier treatment with better outcomes. Varma has worked on several ophthalmic books that focus on these fascinating advanced tools and treatments. When cataracts cause your eye’s lenses to become cloudy, technology is on your side to surgically correct the issue. Lasers are allowing surgeons to make more precise incisions to perform cataract surgery, but that’s not all. After the affected lens is removed, the surgeon uses a sophisticated microscope to measure the eye so they can better match it to the correct replacement lens. That technology is making cataract surgery more accurate, especially for patients who have had a previous eye surgery. One of the most significant technological advances in eye care is laser eye surgery. The relatively non-invasive procedures can effectively correct visions problems like myopia and astigmatism. While surgery on the eye can feel uncomfortable, these procedures only take a matter of minutes with minimal pain and recovery time. Most who have undergone laser eye surgery agree that they felt that their vision correction is worth the procedure. While wearable tech devices can monitor your heart rate, exercise, sleep, and more, there is more in store for the future. Soon you can expect to see wearable technology specifically designed to assist those with vision problems. In fact, right now several major tech companies are working to design smart contact lenses that will provide more advanced vision correction than anything we have seen so far. It is hard to say when these will hit the market, but once the scientists have perfected the design, they might well become the future of eyewear. Contact lenses are being developed with the hopes that they might stop or slow myopia in children. Short-sightedness can’t be avoided, however, slowing its progress can improve eye health in the long-term. New types of contacts are being designed with other health needs in mind. For example, anti-allergy contact lenses are sure to be all the rage during allergy season for those who hope to avoid having to wear glasses in order to avoid itchy, watery eyes. Special high-tech contact lenses are also being developed to monitor conditions like diabetes and glaucoma. Diabetes can lead to vision trouble or even vision loss, and glaucoma causes slow vision loss, eye pain, and vision issues, so this tech works to save your vision by simply wearing contact lenses. With the help of technology, eye care has come a long way in a few years, and with continued research and development, it certainly has more room to develop to the benefit of everyone.